Here at Mummyfique, we believe in supporting local talents — whether they be small business owners, or mumpreneurs — so engaging with designers and artisans in Singapore is a strong part of our DNA. Hot off our partnership with kaftan label BaeBeeBoo, we are pleased to announce our latest collaboration, the ELOHIM x Mummyfique collection. 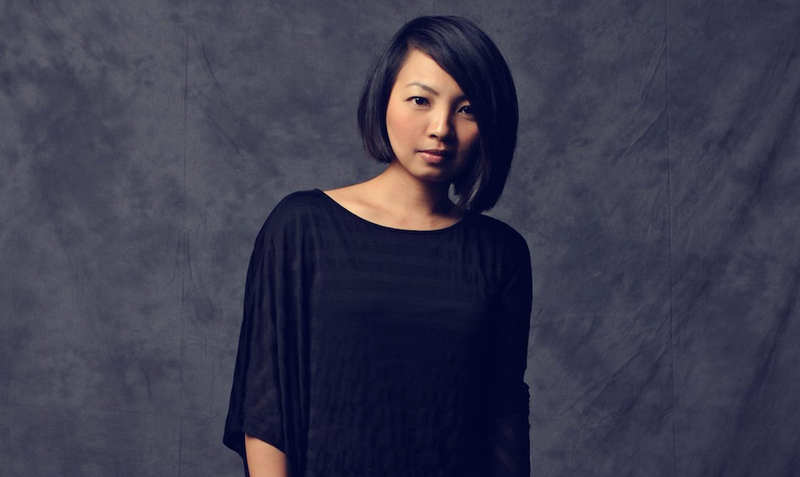 Founded in 2007, ELOHIM by Sabrina Goh is one of Singapore’s top homegrown labels, known for its unique silhouettes and fresh take on design. 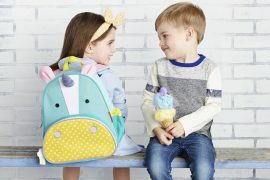 In this interview, designer Sabrina Goh, shares with us her inspiration for the collection (which is her first ever range for kids), and why you’ll want to dress your minis in her stylish threads. On Girl: ELOHIM x Mummyfique Lane Top, ELOHIM x Mummyfique Nordic Culottes , Dr Martens shoes; On Boy: ELOHIM x Mummyfique Aiden Long Sleeve Shirt, ELOHIM x Mummyfique Mason Drop Crotch Pants, Dr Martens shoes. Mummyfique: Please share with us your inspiration for this collection. 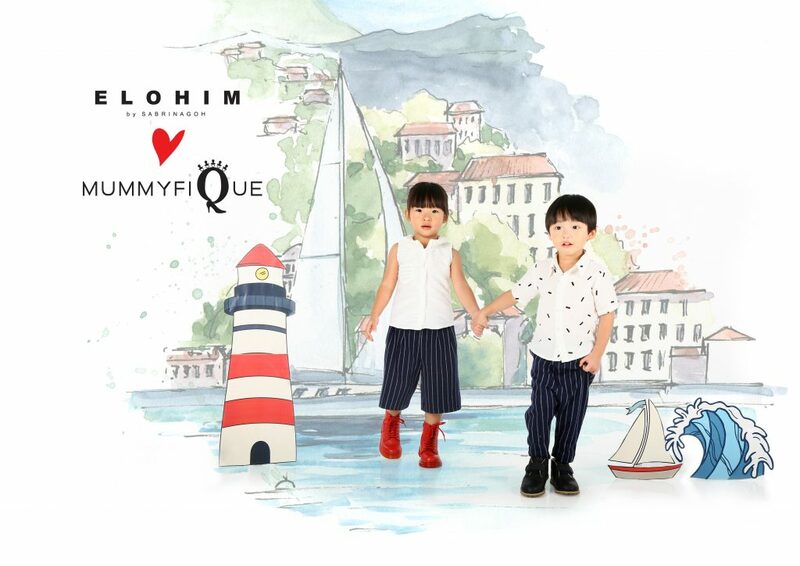 Sabrina Goh: When I designed this collection in collaboration with Mummyfique, I thought of holidays, vacations, breaks, and spending quality time with my family. Hence, there is a nautical theme to every outfit, with navy stripes, a textured knit-like sea wave, lace material and a minimal stroke print in viscose linen, being the main features highlighted in this capsule collection. This is the first time you’re doing a kids’ collection, what made you decide to try your hand at designing for children? It is something that I have been wanting to do for some time now, so this collaboration with Mummyfique was the perfect starting point. Designing for kids and adults isn’t that different, but I have paid special attention to certain details as kids clothes have to be kid-friendly. Please share with us what you tried to achieve with this collection? 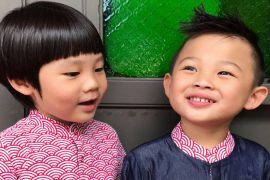 As we have tropical weather in Singapore, I was deliberate in my choice of fabrics – they had to be practical enough to wear when the weather is warm, especially since kids move around a lot. Therefore, the collection uses breathable fabrics like cotton, Tencel, viscose linen, rayon and other lightweight polyesters, which work well in Singapore’s climate. I really like the Tagan Midi Dress (pictured below) — it is simple yet stylish. You can dress it up for a party or down to create a more relaxed, resort feel. The fabrication choice also gives the look some attitude, structure and shape. How would you personally style the outfits? Play on the nautical theme with accessories. A handkerchief, for instance, adds colour and brings more fun to a look. You can also don woven toquilla straw hats for a resort look. Will fans of ELOHIM who are parents find that they will now be able to dress up in similar outfits as their children? 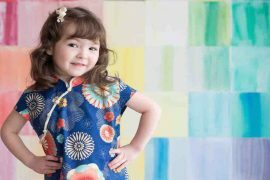 This kidswear collection is designed specially for the collaboration with Mummyfique, hence it will not look exactly the same. However they do have the same style and aesthetic that ELOHIM clothing is known for. Priced from S$119, the ELOHIM x Mummyfique collection will soon be available on Mummyfique’s e-shop as well as Motherswork Great World City from 1 December 2016.